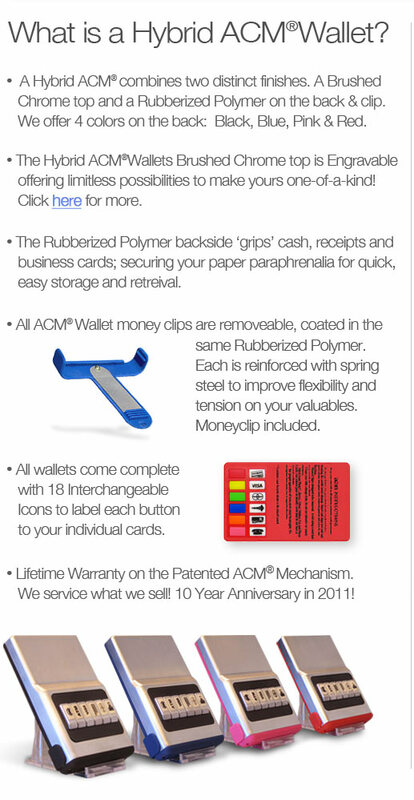 Available in 6 or 12 Card Capacity The ACM Wallets innovative, patented design allows you to organize, protect and select up to 6 or 12 of your favorite credit, I.D. and membership cards quickly and easily at the push of a button. The ACM's precision card spacing feature is the key to preventing card demagnetization, scratching and premature failure of your cards magnetic strip. Once loaded in the ACM Wallet, your cards never touch anything except the very outside edges. A special built-in system adjusts, keeping your cards secure in each individual slot. The ACM allows you to organize, protect and select your credit and other cards easier, faster and with less hassle than ever before.